Pay securely anywhere with mobile payments. It’s the same PayPal security you know, but even faster with mobile payments. With One TouchTM, you can spend less time paying and more time playing. 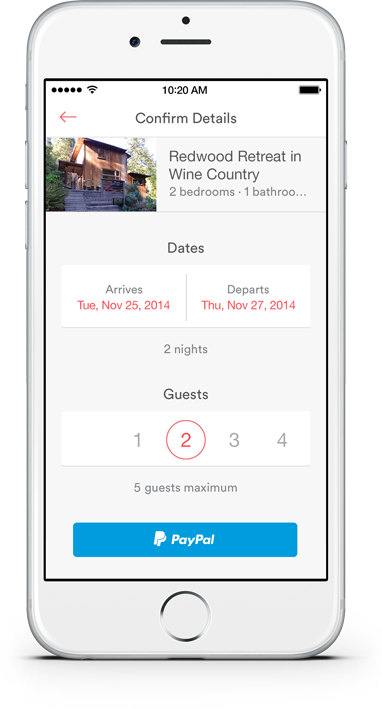 Use PayPal to pay across apps with One TouchTM. Use the mobile app to pay without reaching for your wallet or entering your credit card info. Confidence has never been so convenient. When you shop using One TouchTM, just log into PayPal once. Then you can shop quickly, where PayPal is accepted without re-typing your password or PIN for up to 6 months. Adding a way to pay is a snap. Just take a picture of your bank, debit, or credit card and upload it to your digital wallet and get access to mobile payments. And to make mobile payments even easier, we also work with just about any bank across the United States. Anywhere. It's a good place to make secure mobile payments. Your transactions are monitored around the clock and protected by encryption. If something happens, you can suspend your account from the Web, or call our dedicated team of security specialists. Sixty-six billion dollars was spent globally on mobile devices with PayPal in 2015. Mobile payments and money at your fingertips. Shop using One TouchTM on your phone or tablet, including iOS or Android devices. Who wants fees when there’s so many other things to want?